It's no secret that I have a strong affinity for Mexican and Tex-Mex cuisine. Having grown up in a wasteland of mediocre to bad Mexican restaurants, it wasn't until my (now) wife brought me down to her home state of Texas for the first time that I realized how incredible Mexican food really is. The flavors often invoke a freshness and brightness that pairs with spicy and fruity peppers that combine into plates that are as exhilarating as they are beautiful. 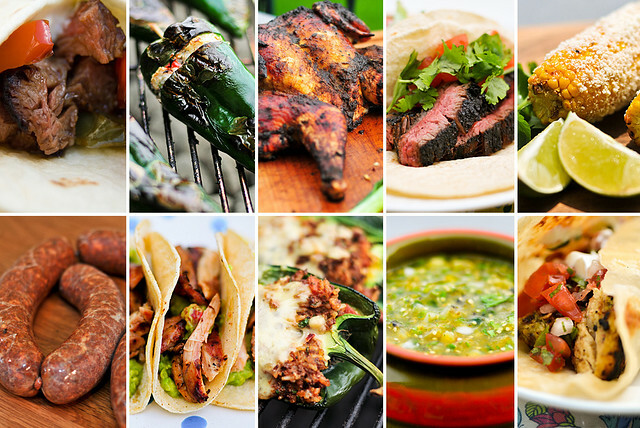 Alongside barbecue, Mexican, and its cross-border incarnations, have become the backbone of what I cook at home, and so over the years, it only makes sense that I've collected a slew of really great Mexican grilling recipes on the blog. It's more than enough to put together an excellent spread for Cinco de Mayo (or any party for that matter). After eight years of the Meatwave, it's blatantly obvious that I don't shy away from grilling just about anything. My recipe arsenal is a conquering force, perpetually expanding its reach and power. Still, when it comes to the major grilling holidays—Memorial Day, 4th of July, and Labor Day— I'm with the populous, nothing beats hot dogs and hamburgers with a side of grilled corn. This is the trifecta of the backyard barbecue, and no matter what craziness I throw at my grill, there will always be a strong affinity for the classics. 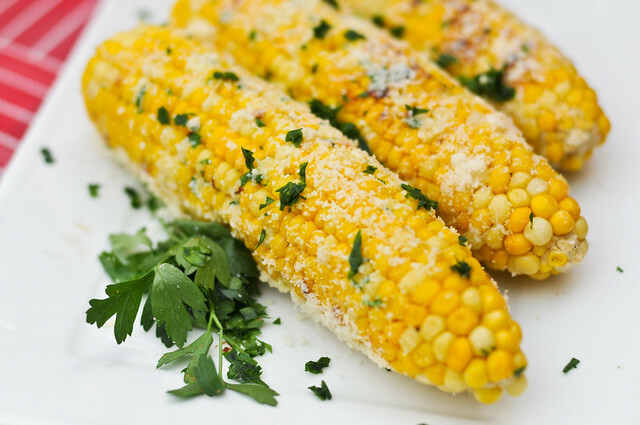 The only problem is my wandering mind still can't leave well enough alone, which I guess isn't such a bad thing, because it came up with this Italian-style grilled corn. Here it is, a post 4 years in the making! 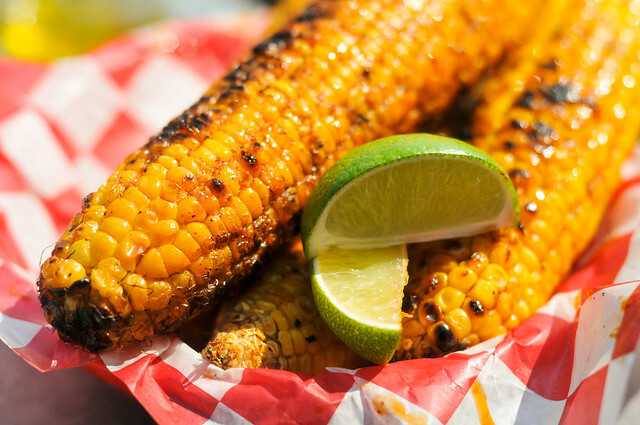 Well, not really, but I first put together a recipe for the most excellent Mexican-style grilled corn back in 2008, but didn't quite have the photos I wanted to use for a post, so it sat patiently in my queue. It wasn't until a few weeks ago that I finally took some glamour shots I was happy enough with to finally bring this corn to the blog, but that wait was not in vein, as I've been slowly altering my recipe to make it simpler, yet better. 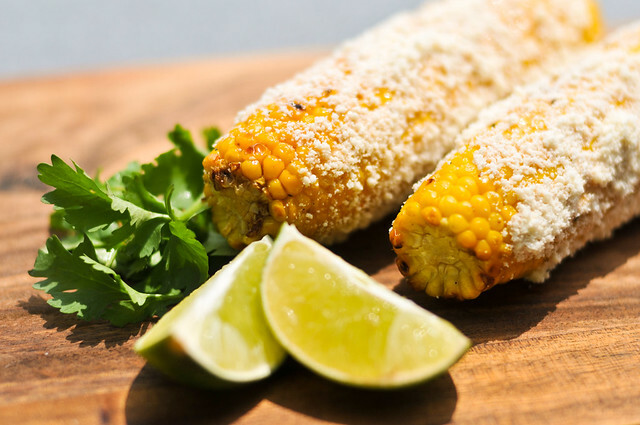 So at long last, I'm finally getting to share my all-time favorite preparation of grilled corn, and I'm confident this is about as good as it gets. For die-hard Meatwavers, you may have noticed that I've gone a full year with regular posts here, which is triumph after the first three years of throwing up a recipe here and there. In keeping the content up, I've let aspirations of site development fall to the wayside—new design, easy printing, and recipe optimization all seem a long way off. In the fall, with well over 100 posts up, I did make one quiet change though, a search feature that was long overdue. In a constant struggle on trying to decide if I want to pay to remove the ads on it (I hate ads), I keep an eye on what my meaty minions are searching every crevice of this site for. One thing that keeps popping up that has been a big ommision is corn.